The Compact Smart Oven® is a smaller version of our popular Smart Oven® – this 1800 watt countertop oven has smart features, but takes up less space. Independent heating elements put the power where it’s needed most. 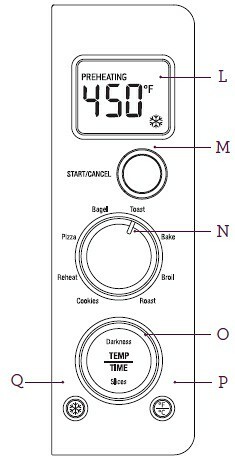 Elements adjust automatically for each of the eight preset functions to deliver the right cooking temperature at the right time. 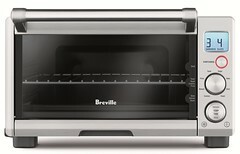 Presets include: toast, bagel, bake, roast, broil, pizza, cookies, and reheat. The oven remembers personal preferences as well. E. Top rack height position: BROIL and BAGEL functions. F. Middle rack height position:TOAST, PIZZA, and COOKIE functions.